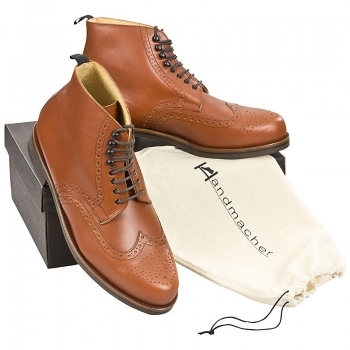 An exclusive selection of high-quality men's shoes can be found in our online shop. We specialize in the wood-nailed shoes of the Handmacher’s factory. You will find all models from the Handmacher Classic, Trend, Leisure and Primus collection. 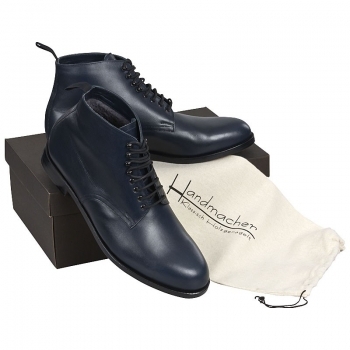 Handmacher manufactures his shoes for men from the Classic and Leisure line in three different shoe width. 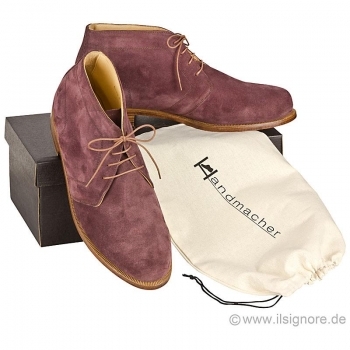 Handmacher trend are available in two and Handmacher Primus shoes even in four shoe width. You can freely combine between numerous leather qualities and sole variants. The well thought-out and proven modular system allows you to get a high-quality men's shoe according to your wishes. High-quality leather and the production of hand-made in small series create men's shoes of a very special kind. 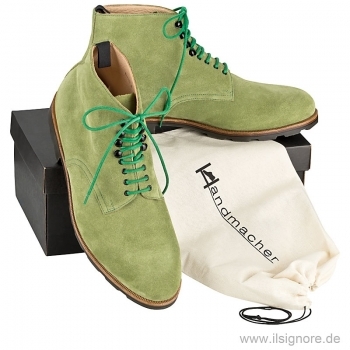 High-quality men's shoes are our passion and we cordially invite you to go on a journey of discovery in our online shop for Handmacher shoes. We offer you an extremely exclusive selection of men's shoes. With us you will find high-quality footwear that you may not have known existed until now. You will receive the wood-nailed men's shoes from the shoe manufactory Handmacher, which are still produced by hand in small series. These special men's shoes set standards in terms of material and processing quality. Immerse yourself in the world of high-quality shoes for men and experience the indescribable comfort of these luxury men's shoes. Both men who are looking for the classic men's shoe and men who prefer extravagant men's shoes will find what they are looking for. The size selection ranges from 39 to 48 and intermediate sizes are also available. If you are looking for a specific men's shoe model that is not available in our online shop, please contact us. The implementation of special customer requests in cooperation with the manufactory Handmacher is our core competence. We also offer you the colour-matching Handmacher belts and briefcases for your new Handmacher shoes. The Handmacher belts are available in the waist-length length from 65 cm to 140 cm. The belts are made of the same leather as the men's shoes of Handmacher. The exclusive bags are available in two different sizes. 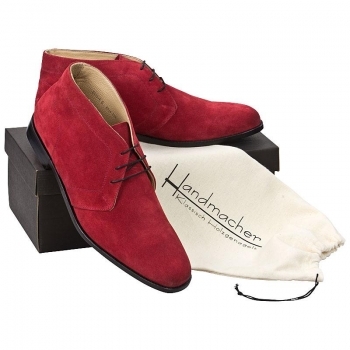 Classic men's shoes, as made by Handmacher, are available as men's summer shoes, men's winter shoes, as well as black men's shoes. 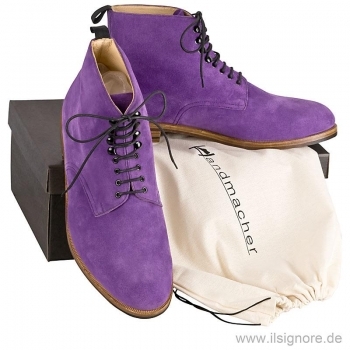 With us, you can buy Handmacher shoes online, easily and conveniently. Of course, our service is just as good for you as the men's shoes, belts and bags on offer. This includes free shipping worldwide. Many models are in stock and therefore within a few days with you. We would be delighted to welcome you as our satisfied customer. A high-quality men's shoe is perhaps the most important piece of clothing. The fact that man travels on average one third of his life shows the importance of high-quality men's shoes. Leather is still the best material for a high-quality and classic men's shoe. The ability of leather to absorb and release moisture again ensures optimal Foot climate. 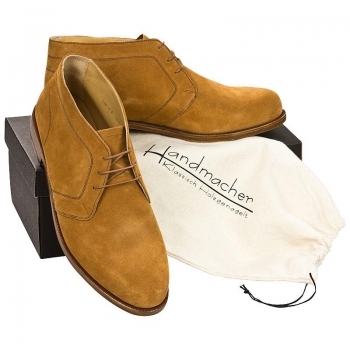 All Handmacher models in our online shop are made entirely of leather, providing excellent comfort. The high-quality leather and the detailed build quality of these wood-nailed shoes also impress discerning customers. For you to enjoy our shoes for a long time, it is best to order the right shoe trees right away. A matching wood shoe tree removes moisture and keeps the leather in shape. If you need oversized men's shoes, you will find a corresponding selection up to size 48 in the Handmacher Classic department. We also offer you the opportunity to buy your new handmade shoes on account. You see: There are many and good reasons to buy your new pair of men's shoes from us.